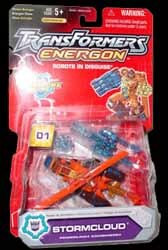 The new Energon range of Transformers toys will take most of us 30-somethings back to our childhood. Although, sadly, we never had anything quite as cool as these. Sure the old Transformers range was great... but this new collection of toys gives even greater value for money. The Powerlinx Combiners range of Transformers toys consists of a whole range of vehicles that can transform into robots. Each is one of a set of five which, when purchased together can be joined to build a giant Transformer. Stormcloud is one of five collectible vehicles with a military theme (models in this range include helicopters and tanks) which can be fitted together to build Bruticus Maximus. Each collection of five vehicles will set you back around £35 (each one is priced £6.99). That's not bad value for money when you add up what you are getting here - five vehicles that transform into six (if you include the mega Bruticus Maximus) different robots. On the downside, it would have been more impressive if the developers had made all of the vehicles different. As it is, you get two helicopters and two tanks in this range. Also when all of the individual Transformers are stuck together to build Bruticus Maximus it does indeed just look like the robot is constructed of two helicopters and two tanks. If a little more thought had gone into making the robots look more like robots then these would have been much better. These vehicles are still great value for money and will certainly appeal to Transformers fans.